As previously mentioned in our blog posts on British Columbia place names, many rooms in the Irving K Barber Learning Centre are named after rivers in British Columbia. This week, we are exploring the history of the Nicola River, after which room 322, a group study room, is named after. According to BC Geographical Names , the Nicola River, one of the major tributaries of the Thompson River, was named after a Nlaka’pamux (Thompson River Salish) chief named Hwistesmexe’quen, or “walking grizzly bear.” According to the third edition of British Columbia Place Names, Hwistesmexe’quen (1785?-1865) was recognized by the fur traders as “the most powerful and influential chief in the Southern Interior of British Columbia” (pg. 190). The French-speaking fur traders nicknamed him “Nicolas” which Hwistesmexe’quen’s people pronounced “Nicolas” first as Nkwala, and eventually as Nicola. Located in the South-Central Interior of British Columbia, the Nicola River was first mapped by Alexander Caulfield Anderson (1814-1884), on his manuscript map of 1849. On the map, the Nicola Lake and Nicola River are shown as “Lac de Nicolas” and “R.Nicolas.” The British Columbia (B.C.) Archives holds a copy of this map, in the archives of Anderson, a Hudson’s Bay Company fur trader. Many unique items, such as Anderson’s manuscript map, are held by the B.C. Archives. The B.C. Archives is an important place to visit if you are planning on doing research into the history of British Columbia; since 1894, the archivists in the BC Archives have collected and provided access to the records of the Provincial government. In addition to visiting the Archives, you may wish to plan a visit to the Research Library, which holds over 70,000 rare and unique items documenting the exploration and development of British Columbia. If you are interested in learning more about Anderson, and his mapping of the province, including the area that that the Nicola River runs through, you may wish to attend the next meeting of the Historical Map Society of British Columbia. On February 6, 2012, Nancy Maguerite Anderson, the great-grandaughter of A.C. Anderson, will be speaking about her book, The Pathfinder: A.C Anderson’s Journeys in the West (Heritage House Publishers, 2011). The Historical Map Society of British Columbia meets at 7:00 p.m. in the Chilcotin Board Room (room 256), in the Irving K Barber Learning Centre. Nancy’s blog, Fur Trade Family History, is a rich resource of information relating to the history of British Columbia. For example, see her entry on the mapping of the Nicola River and Valley; in addition to providing an overview of Anderson’s mapping of the area, she provides many photographs of the Nicola Valley today. Most UBC Library branches, including Rare Books and Special Collections, University Archives and the Chung Collection will be closed from Dec. 24 to Jan. 2 for the holiday season. For full details on holiday hours, please click here. 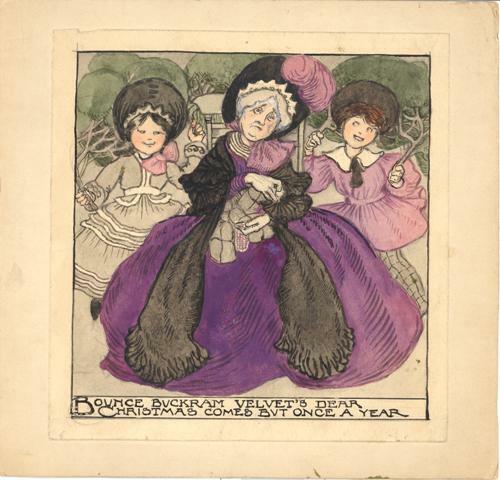 Olive Allen Biller was an English illustrator, who eventually settled in British Columbia after World War I. While in B.C. she turned her attention toward landscape painting, but the above illustration is of her earlier period in England, when she illustrated for children’s annuals such as Blackie’s and Girl’s Realm. 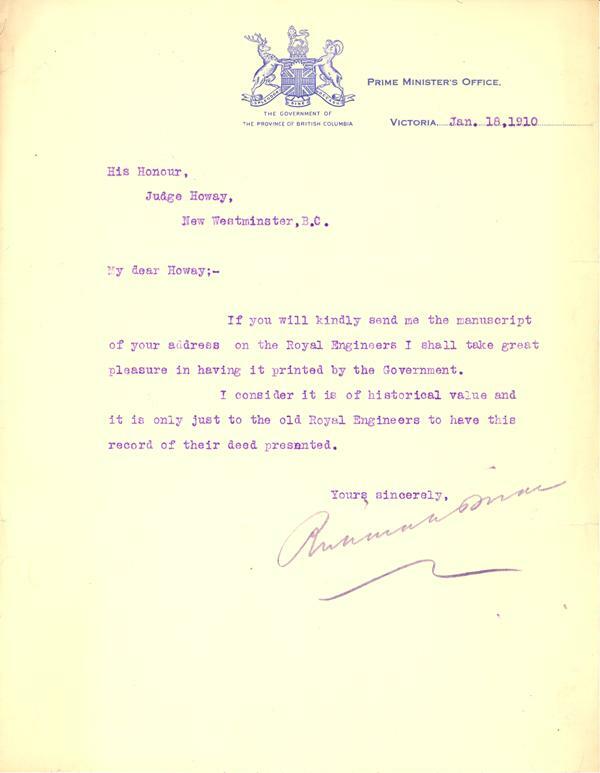 For more information regarding archival material related to B.C. artists, check out our research guide for B.C. art and artists. original works of art. Born in South Africa, Charles moved to still spends part of the year in North Vancouver. The winter months Charles spends on the islands of Fiji. “I first encountered the title “Betwixt and Between” in one of Charles’ publications, “Dream Sketches from the Isle of Tropical Birds”: “The birds are above, the fish are below, and we are betwixt and between.” Charles’ work as well exists “betwixt and between.” Charles can create images of anthropomorphized animals and whimsical fairies but creates naturalistic representations of animals just as well. His illustrations seem to be from the Victorian era, and yet he is only in his 50’s. 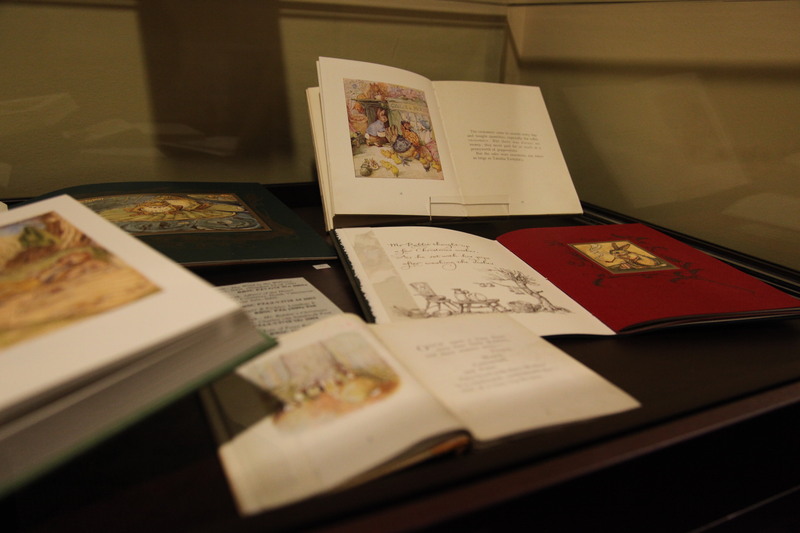 His works appear to be stories for children, but really speak to the inner child in adults. You can’t peg him or his artwork into any neat little category; Charles even remarked that book sellers don’t know where to put his works on the shelves! “In late September, I went to interview Charles van Sandwyk in preparation for the exhibition. Meeting Charles was an incredible experience for me; I have never met someone so warm and genuine and open as he. It is as if you’ve always known him, and he’s always been a dear friend. After a lovely lunch, we went back to his cottage and talked for several hours about his life and career. In the course of our conversations, I realized how deeply his high-school art teachers had influenced the trajectory of his career, in addition to the other artistic influences outlined in the exhibition. I soon decided to include them in the exhibition. It was a wonderful experience to see the relationships emerge and to have the competency to articulate them in such a way that viewers are able to see the connections for themselves. “Rare Books and Special Collections at UBC had a wealth of materials in their collections that allowed my research to proceed smoothly. In addition to owning over forty works by van Sandwyk, RBSC also owned works by every one of Charles’ influences, with the exception of Dorothy Kay. I began research for the exhibition by exploring all of van Sandwyk’s publications in depth, then exploring works of his influences held by RBSC. Some connections between the artists emerged easily, whereas others required a good deal of insight. A drawing Rembrant did of an elephant paired perfectly with an illustration of an elephant Charles did for “Animal Wisdom”. “In comparison, Albrecht Durer was a little more complicated. For the exhibition, I explored how the two artists had produced Ex Libris book plates for patrons and the different ways they explored the space constraints of the materials. I also truly enjoyed how some cheeky comparisons emerged, such as the juxtaposition of an etching of a Burgher Rembrandt made in contrast to a monkey sitting in a similar pose, etched and colored by Charles. Charles’ monkey has an air of thoughtfulness and respectability to him, very similar to Rembrandt’s Burgher. Some of the books on display, such as the texts by Gandhi, Gilbran and Kay, are from Charles’ personal collection. 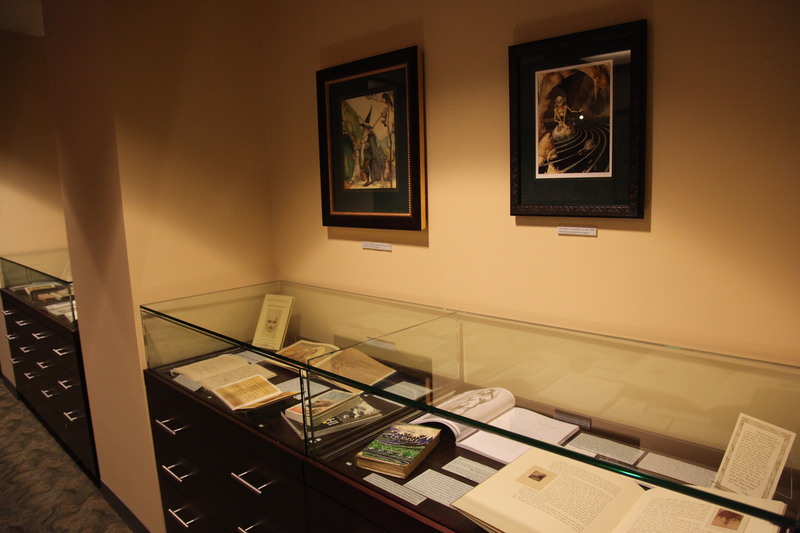 It was also very exciting to be able to hang framed works on the walls above the cases. Don’t miss this opportunity to see original works by Charles van Sandwyk (the “Fiddle Beetle” is my favorite) and even Arthur Rackham. Thank you Heather for providing the curator’s perspective! If you would like to see the exhibition you can do so until Dec. 17, from Monday to Friday 9-5 and Saturdays 12-5. 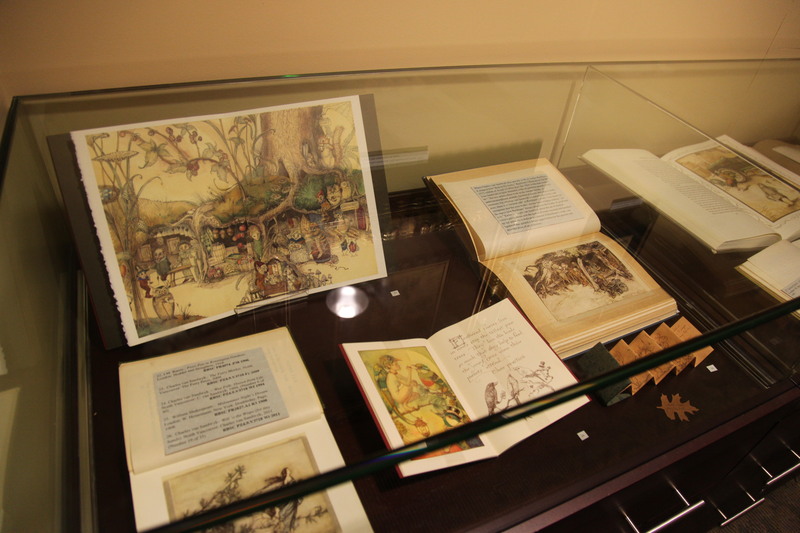 The exhibition is located in the back of the Chung Room, which is accessed through the Rare Books and Special Collections reading room. The exhibition is free and open to all members of the public. In this installation of our blog series exploring B.C. places from the Irving K. Barber Learning Centre rooms, we will explore the village of McBride, or in this case, its namesake. McBride is located in the Cariboo, between Prince George and Valmount, very close to the Albertan border. Settled during the construction of the Grand Pacific Trunk Railway in 1913, it is named for Sir Richard McBride, who was the premier of B.C. from 1903-1915. The railway was one of McBride’s major platforms, along with the establishment of a provincial university, which would become UBC. Suppose you wanted to find pieces of correspondence to and from McBride in our collections here at Rare Books and Special Collections. This is a great example of how more than one method of searching is sometimes necessary. 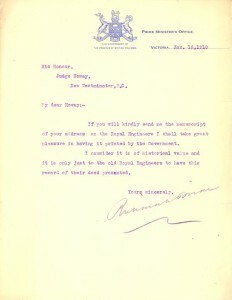 There are six letters from McBride to Howay (a judge, author, and collector of British Columbiana whose book collection is one of the founding collections at Rare Books and Special Collections). 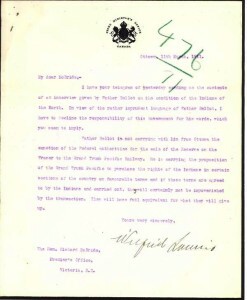 Among them is this letter in which McBride invites Howay to send his manuscript about the Royal Engineers for publication by the government. That manuscript presumably became this printed pamphlet. 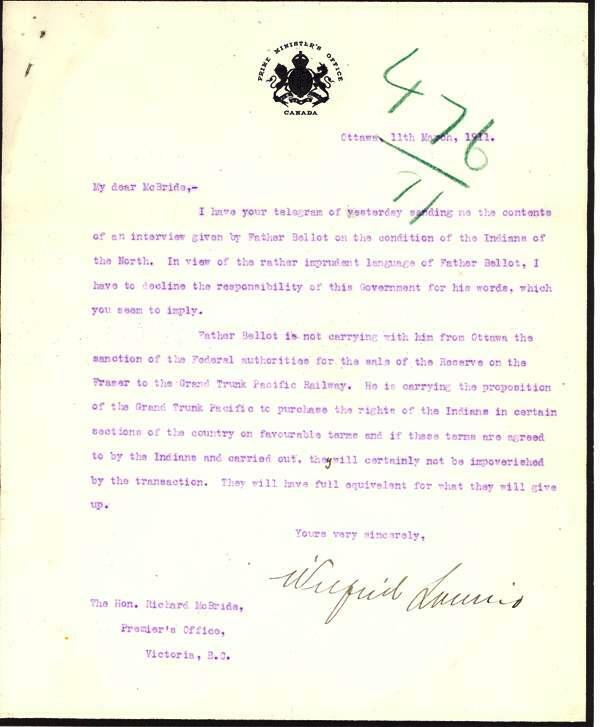 In it, Laurier refers to land transactions being made between First Nations groups and the government for the construction of the Grand Trunk Railroad. Do these two search methods guarantee that you will find all archival documents related to Richard McBride? Unfortunately not. The nature of archival description is that it tends to describe groups of records, not individual items- if archivists catalogued every document individually, we would be hopelessly behind in our work! When using archives for your research, you sometimes have to think a little more creatively- who would have Richard McBride been corresponding with, and about what? This helps you choose appropriate keywords for your searches. For more resources on using archival material, check out our Archival Material research guide. In the Barber Centre, the McBride Meeting room is room 265, which is one of the meeting rooms on the south side of the building, off of the Ike’s Cafe eating area.